There are approximately 125 species, most of which are native to Asia, but several species also occur in Europe, northern Africa, and North America. Maples are mostly trees growing to 10-40 m (30-130 feet) in height. Others are shrubs less than 10 m tall with a number of small trunks originating at ground level. Most species are deciduous, but a few in southern Asia and the Mediterranean region are evergreen. Maples are important as source of syrup and wood. They are also cultivated as ornamental plants and have benefits for tourism and agriculture. Obviously the weather for the few weeks during which the trees are tapped is extremely important. For the maple sap to run, the nights must be cold, below freezing, without being too cold. Night temperatures should ideally be in the mid 20’s. If the temperature falls to far below freezing, the sap will take to long to warm up the next morning, and will not run well. If the temperature is too high, above freezing, the sap just won’t run the next day. Daytime temperatures are just as important. The temperatures during the day should be in the mid 40’s according to most people. If the temperature doesn’t rise above freezing, the sap will not run at all. If the temperature is too high, the sap won’t run either. While all of these things are not totally understood, it does seem to be the truth. 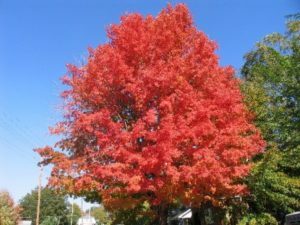 Maple tree care begins when considering where to plant the tree. Most maple trees prefer a site that is generally in full sun to partial shade. Different varieties of maple tree care for different soil conditions. Some enjoy soil that is moist and well drained, while others can be tolerant of flooding or drought. The fertilizer that should be used will also depend on the type of maple tree in question. Maple tree care will continue as the tree begins to grow. A stake may be required in areas that are windy until the roots have a chance to establish themselves. Maple tree care also entails proper pruning of the tree. Different maple trees grow in different ways, and many can also be trained. Some maple trees have only on main trunk, called a central leader. Others can be trained to have a central leader. This depends on the type of tree and the result that the landscaper is looking for.